This lasagna was so popular, it was almost gone before I could snap a picture! This lasagna adds a few extra touches to make it special. Preheat oven to 375 degrees. 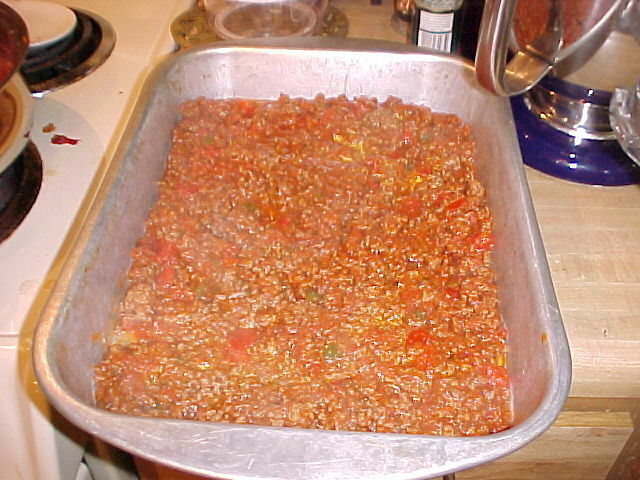 Brown ground beef, onion, pepper, mushrooms and spices and drain well. Add sauce and simmer. Spray non-stick cooking spray in a 13" x 9" baking pan. 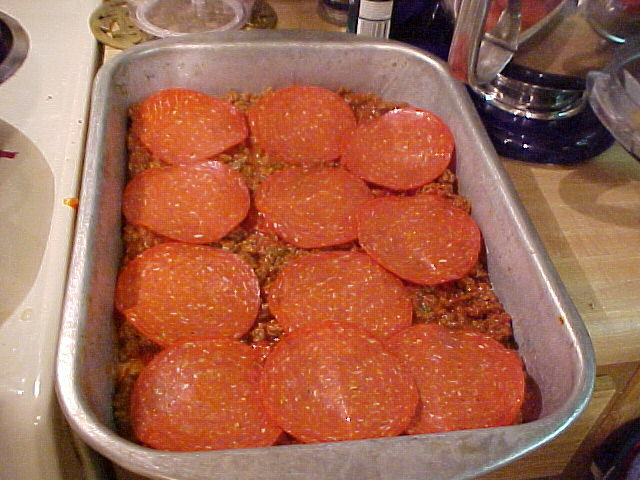 To assemble: spread a thin layer of the meat sauce in the bottom of the baking dish. 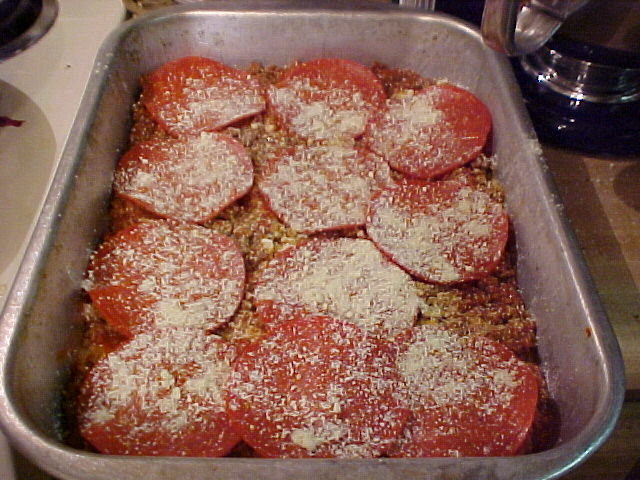 Sprinkle with 1/3 of the additional parmesan cheese, and layer 1/2 the pepperoni on top of this. Sprinkle about 1/3 of the additional mozzarella on top of this. Lay 1 layer of overlapping noodles across this to completely cover. Spread all of the ricotta cheese mixture across this layer of noodles and top this with another layer of overlapping noodles. Spread the rest of the sauce on top of this, followed by the rest of the parmesan, the rest of the pepperoni and the rest of the mozzarella cheese. Bake for approximately 45 minutes until completely browned and bubbly. Remove from oven and allow to sit for at least 5 minutes before attempting to cut into squares for serving. This will allow it to cut neatly and will give you time to bake your garlic bread. Serves 8. 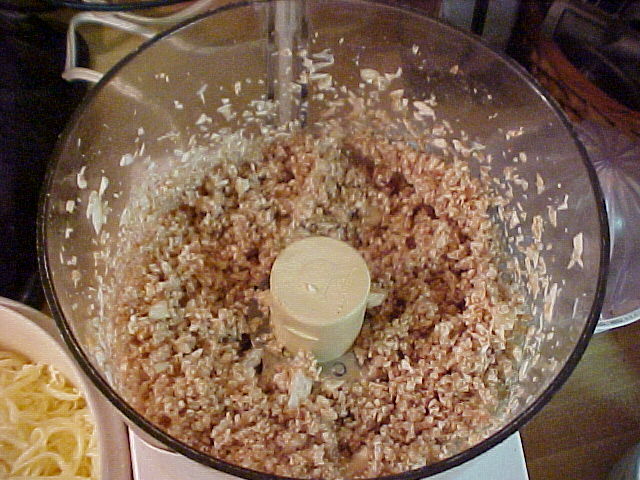 Optional: I grind the fresh mushrooms in the food processor and brown them with the ground beef. 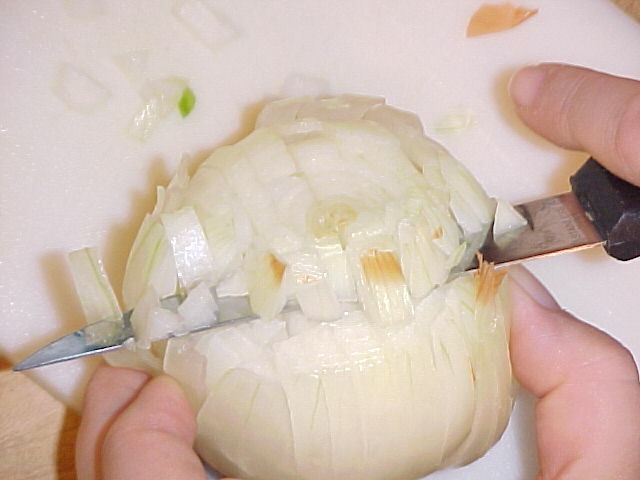 Note the technique for chopping onion... cut vertical and horizonally into the onion and then slice. Crumble ground chuck on top of veggies and brown, chopping beef with spatula as it browns. 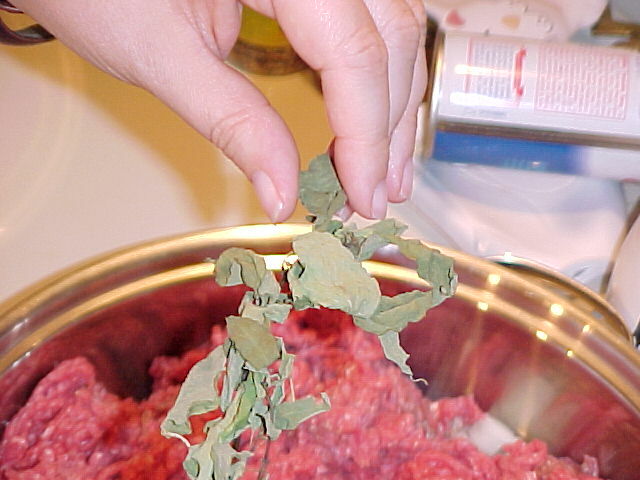 Add oregano to the ground beef. Here I'm crushing oregano I grew & dried, but you can use any kind. 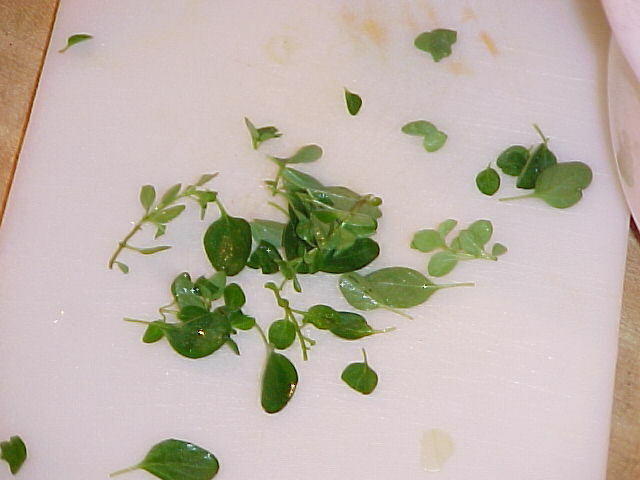 While fresh basil is best, you can use dried basil if you prefer. 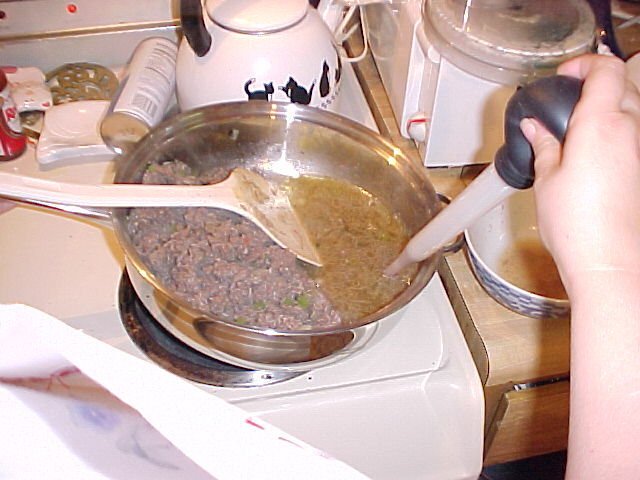 Once beef is browned, you will need to drain off the grease. Here, I use a turkey baster for this. 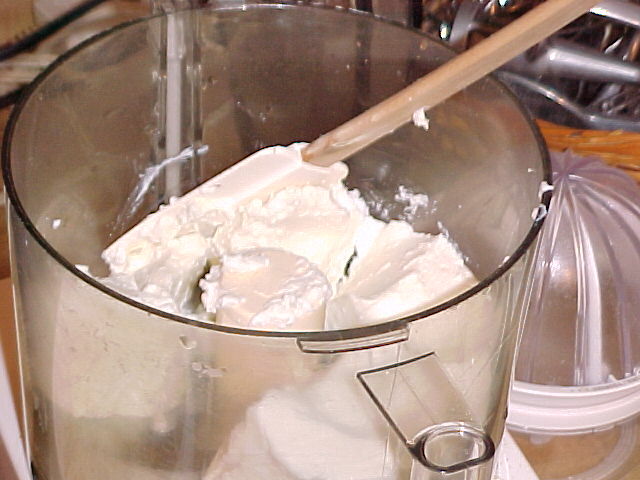 Place ricotta in Cuisinart or large bowl (mix it yourself, if you don't have a food processor). 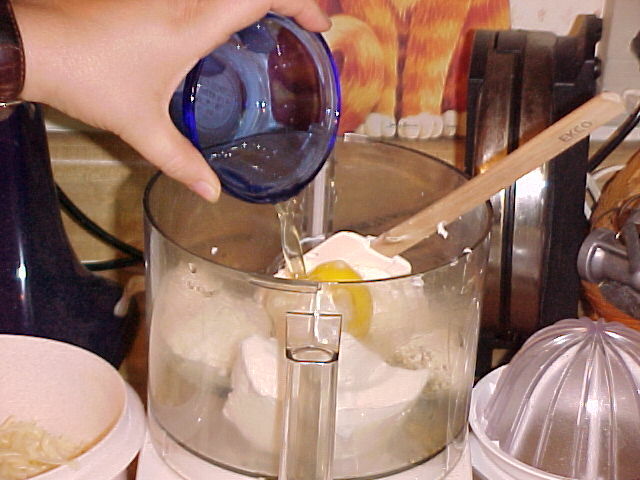 Add 1 large egg to the ricotta cheese. 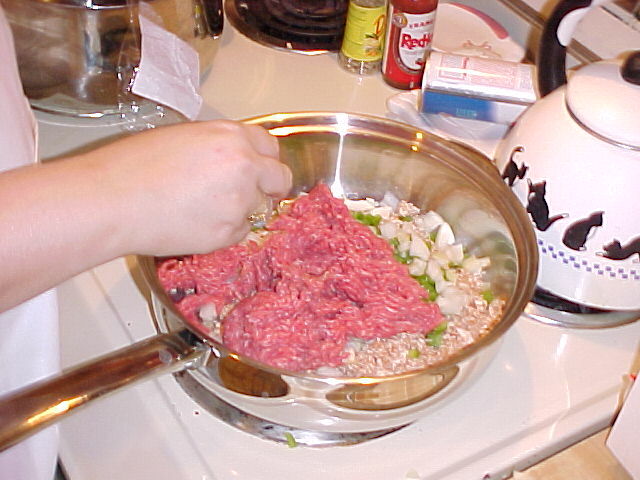 Add tomato sauce (or spaghetti sauce) to your browned ground beef. Let simmer. Add about 4 TBS Parmesan cheese., 1/2 C. shredded mozzarella, parsley flakes, salt, pepper and garlic salt to cheese in processor or mixing bowl and mix thoroughly. Spray your 13" x 9" dish with cooking spray. Now spread a thin layer of your meat sauce. 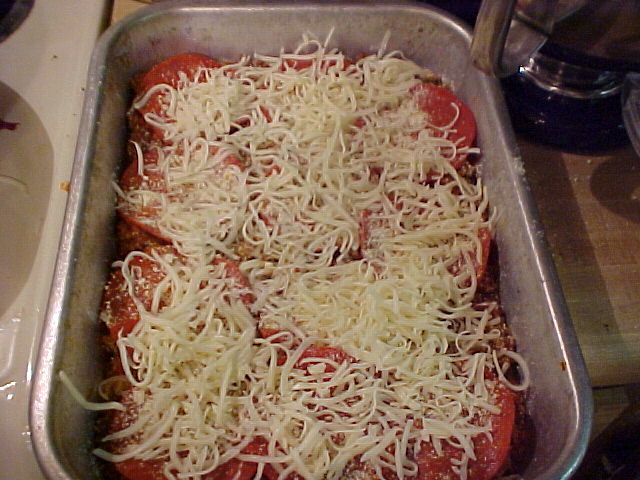 Put a layer of pepperoni on top and sprinkle with parmesan and then add a layer of shredded mozzarella. 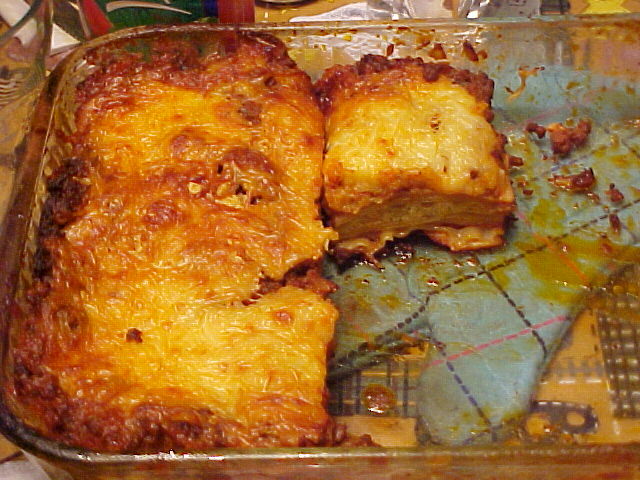 Lay on a complete layer of cooked lasagna noodles. Spread all the ricotta cheese mixture onto the noodles into an even layer. Add another complete overlapping layer of noodles. Add the rest of your sauce, another layer of pepperoni, another layer of parmesan cheese, and the rest of your shredded mozarella and bake for about 30-45 min. on about 350 degrees. Be sure to watch carefully if you're using a glass baking dish that it doesn't get too browned on the bottom. Do let it get nicely browned on top. Remove from oven and let it sit for 5 min. 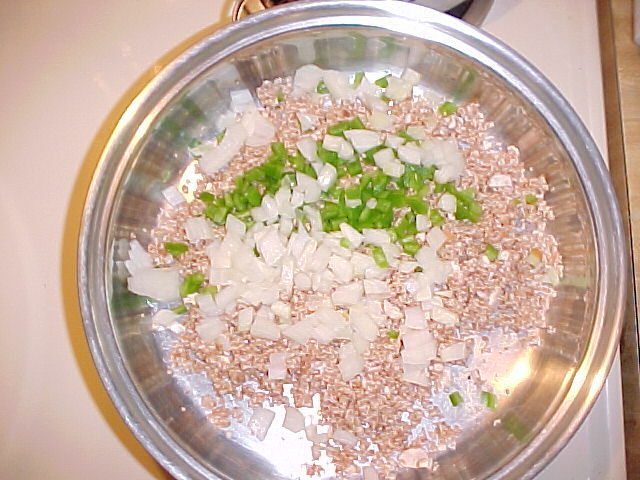 before cutting and serving. This will ensure that it will be nicer when you serve it. If it is too hot and too soon out of the oven, you won't be able to cut it into neat portions.